[Milky way] Is it a spiral? I hope this is the right section. But, can anyone here tell me how is it that we know the our galaxy is a spiral one, i don't doubt what i've read, but i need an explanation. I read something about density waves and how they power the rotation of our galaxy andor other galaxies. But how do we know for sure ours is a spiral body? if im not misstagen spiral is the most common form of a galaxy. so by that we can tell its more likly it is. but then we cant be sure. so if we take a look at stars where they are how far it is and place them in a computer we would be able to see that they form a spiral and can by that draw the conclution that the galaxy is a spiral. - A disk. Just look at the sky on any clear night and you'll see a band of stars stretching across the sky. This is the Milky Way disk. Ellipticals don't have a large stellar disk like that. - Young stars. We observe young, blue stars in the Milky Way, just as we do in many spirals. Ellipticals, on the other hand, tend to have old, red populations. - Gas. Ellipticals generally have very little gas, while we have been observing neutral and ionized gas in the Milky Way for many years now. Those are just the obvious qualities. Since then, a much more detailed analysis has been done and we've found spiral arms, a bar, and a multi-disk structure. I read something about density waves and how they power the rotation of our galaxy andor other galaxies. The rotation of the galaxy doesn't need power because there is very little dissipation. It just comes from the initial angular momentum of the matter that collapsed to form the galaxy. The spiral arms are just, as you say, density waves that form as a result of instabilities in the disk. They have been known to initiate star formation, so perhaps that's what you're thinking of. if im not misstagen spiral is the most common form of a galaxy. The most numerous type of galaxy is most likely the dwarf spheroidal galaxy (not much bigger than a globular cluster), but it's hard to tell because we can't see them beyond the local group. Of the large galaxies, spirals are more numerous overall, but it depends on where you're looking. Outside of galaxy clusters, spirals are more common, but inside them you will find many more ellipticals. But, can anyone here tell me how is it that we know the our galaxy is a spiral one? As well as the optical evidence as to the nature of our galaxy that SpaceTiger has described the most direct evidence is the mapping by radio astronomy of HI regions at 21cm wavelength, and now IR astronomy, both of which can 'see through' the dust in the galactic disc. The map clearly showed spiral arms, but quite close together. We now know the Milky Way is a Barred Spiral with a small bar across the centre from which a close formation of arms spiral out. A SBa type of galaxy, quite 'special'! We now know the Milky Way is a Barred Spiral with a small bar across the centre from which a close formation of arms spiral out. A SBa type of galaxy, quite 'special'! I did a little research on my own and found quite a few Milky Way bars at the local supermarket. And here too Garth. Just by coincidence it happens to be today's Astronomy Picture of the Day. Right you are. I was thinking about deleting my post, but I decided it's good to have a link to the apod page with the brief explanation written by a professional astronomer. It was William Parsons (3rd Earl of Rosse) that first observed spiral structure in some "nebulae". 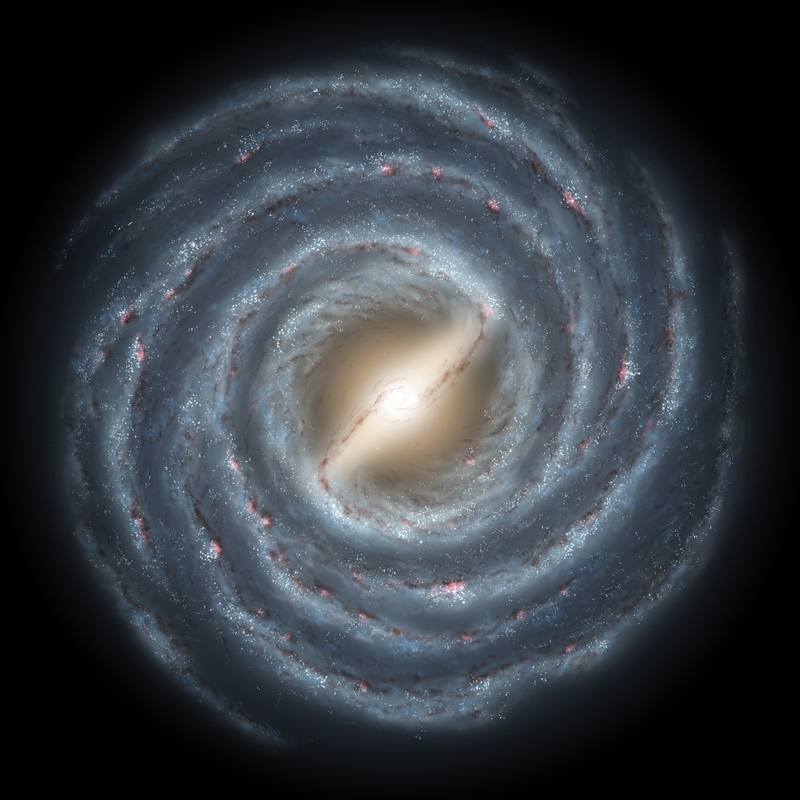 Many people over the ensuing years speculated that the Milky Way had spiral arms too. However, it was not until 1951 that the first scientific evidence was presented. In the 1940s Walter Baade recognized that in (other) spiral galaxies, the older, redder, stars tended to reside in the central regions (of the galaxy) while younger (blue-white) stars are to be found in the spiral arms, along with HII regions. In 1951 at Yerkes Observatory, William Morgan, along with Donald Osterbrock and Stewart Sharpless, determined the distances to many (dozens) of blue giants and HII regions "close" to our solar system. This enabled them to map segments of a few of MW spiral arms for the first time. "Some features of Galactic Structure in the Neighborhood of the Sun"
The Astrophysical Journal, Volume 57 (1952). By Morgan, Sharpless, & Osterbrock. Radio observations soon advanced our knowledge of the MW spiral structure (particularly the early ones by Oort, Muller, and van de Hulst). I was reading in http://www.solstation.com/x-objects/gal-ring.htm that some barred galaxies have outer rings which might be a result of a resonance with the dynamics of the bar. These galaxies have an own name "resonace-ring galaxies". It seams that the Milky Way contains such a structure (see link above), so may be the Milky Way should be classified as a resonace-ring galaxy? "[Milky way] Is it a spiral?" You must log in or register to reply here. Related Threads for: [Milky way] Is it a spiral? The Milky Way is Not a Spiral? Milky Way; How do we know it's a spiral? Stars of Constellations exist in what Spiral Arm of the Milky Way Galaxy? How big is milky way ?